My latest post on ELinfonet is up! Please check out The Death of NLRA Disclaimers in Social Media Policies? 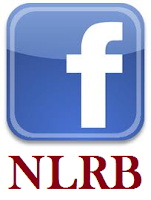 My new article covers NLRB guidance on social media policies, and explains why a simple disclaimer that the policy "will not be construed or applied so as to prohibit NLRA-protected activity" is a big failure. It also includes some tips for a better disclaimer that addresses some of the NLRB's concerns (although the NLRB hasn't had any trouble raising new concerns, so proceed with caution! ).